On 30th June 2013, I sat down and decided I would start writing every single day. I haven’t missed a day since – which means a couple of weeks ago I hit the two year mark in my writing streak. I’ve already posted a by-the-numbers breakdown of my streak so far, but I thought I’d also post a few tips on how I’ve kept that streak running. I’m talking specifically about writing here, but the same principles apply to forming other habits – like running or push ups or monkey juggling. So, here are my tips for anyone trying to get the writing habit to stick. The first thing you need to do is decide what habit you’re trying to form. I kept mine very simple – write or edit some fiction every day (blogging doesn’t count). No word count goals, no time goals. As long as I write at least one word, I’m done. In reality, I try to get down at least 100 words, otherwise I feel like I cheated. The key here is to not overstretch yourself. Pick something that you are confident you can achieve. It’s very easy to get overexcited and commit to something that’s too hard. Goals like “write 10,000 words a day” or “write a novel in a month” sound great on paper but when life gets in the way (and it will), your habit will quickly fall by the wayside and you’ll get demotivated. Make sure that your habit supports the overall goal for your writing. Our brains are very good optimisers – they’ll find the easiest way to achieve your goal they can, even if it doesn’t get you the outcome you were intending. This is the second writing streak I’ve done. The first time my goal was to write 500 words a day until I’d finished the first draft of my novel. I succeeded but I discovered that I was focussed almost entirely on writing those 500 words when what I really cared about was the complete novel. I would write 500 words of junk and be happy, even though when I came back to edit the novel I had to kill most of it. A lot of people work that way and that’s fine, but I don’t. Make sure you pick a daily goal that supports your long term goal, rather than derailing it. “Under promise and over deliver” is the way to go here. You can always try to expand your goal later. I’ve tried to add word count goals multiple times over the last two years and always end up missing them eventually. Thankfully, the write every day goal is still there as a safety net. It’s been shown that keeping a food diary when dieting can double the amount weight lost. Tracking your writing progress keeps you on track in a similar way. I have a detailed spreadsheet where I track the time I spent writing, what project I was working on, how many words I wrote and whether I was outlining, writing something new or revising and most importantly – how many days I’ve written in a row. I’m a big fan of metrics and get a lot out of that data. Seeing that ever increasing “days written” number is a huge motivation to sit down at my desk. In fact, for me it’s the number one thing that gets me in the chair. You don’t have to go as far as I do but keeping a record of your progress your goals is critical. Even something as simple as marking a calendar with a green sticker for every day you write helps. There’s a proverb, usually attributed to the Spanish, that goes “Take what you want and pay for it.” Or to put it another way, you can have pretty much whatever you want, as long as you’re prepared to make the required sacrifices. Obviously, that doesn’t apply to everything – I’m never going to win the Boston Marathon, no matter how hard I train – but I could, if I wanted it badly enough, qualify for the Boston Marathon. I could eat better, train harder, hire a really good coach and get quicker. Eventually I’d qualify. But I don’t do all those things because it’s not important enough to me. The same goes with your writing. You can write your science fiction novel, your epic fantasy trilogy, that Star Trek/Dora the Explorer fan fiction if you want to. But you’re probably going to have to prioritise your writing above other things you enjoy. To me, there are three types of writer – those who would like-to write, those who want-to write, and those that need-to write. People who need-to write watch less television, play less videogames, watch less movies, go out drinking less, sleep less, write in barber’s shops, write in airports, write early in the morning, write late at night, whatever they have to do to get those words down on paper. I’ve done all those things because writing is more important to me that television or videogames or movies. Even a bad writing session is better than none. I haven’t given them up completely, I still find time to relax, but only once I’ve done the day’s writing. 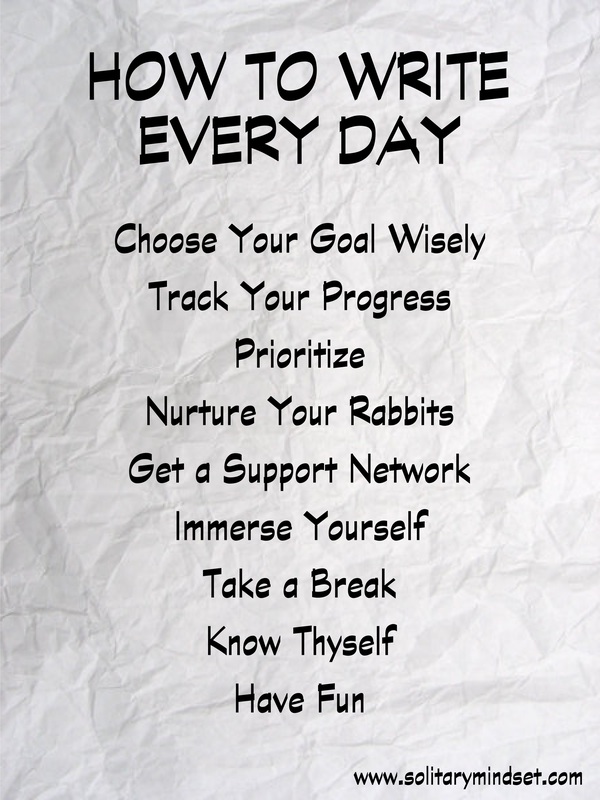 If you’re writing every day, you need something to write, so, nurture your rabbits. Keep a notebook of story ideas, trawl the internet for writing prompts (Chuck Wendig posts a Flash Fiction challenge on his blog every Friday for example), get the Writer Emergency Pack. 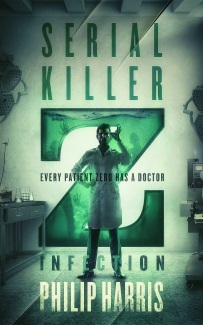 Even just a story title can be enough to get you started on your day’s writing. I have several novel fragments and half-written stories that I used as “filler” between bigger projects. Some of them don’t go anywhere but sometimes they take on a life of their own. 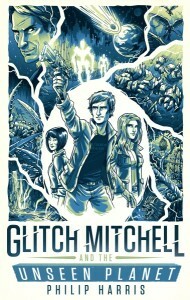 Glitch Mitchell and the Unseen Planet began life as something to write between drafts of another project. It quickly grew into a full length novel. Always have something you can write when you’re done with your current project so that you can keep up your momentum. I’m incredibly fortunate to have a wife that supports my writing. She knows that it’s important to me and lets me disappear into my office for hours at the weekend to plug away at my writing. She encourages me when I start to doubt myself, she reads my novels and stories and points out problems, and she gets excited alongside me when a story is published, or I sign a deal for a novel. Try to find someone who can be on your team. Maybe it’s a partner, maybe it’s a friend, but having someone to encourage and support you can make all the difference. At the very least, you need to make sure that the people around you understand that writing is important to you, that you need to write. They need to be okay with you not watching America’s Best Top New Model Idol with them. They need to be okay with not interrupting you to chat about their day if you’re writing. They need to know you’re going to want to splurge on a posh meal when you sell your first story or get your first indie sale. Set those expectations up front with friends and family and things will go a lot smoother. Even when you’re not writing, do what you can to immerse yourself in the world of a writer. Read books on writing, read author biographies, follow authors on Twitter or Facebook and chat to them if you feel you can, go to a writing convention or an author reading. Listen to writing podcasts – Mat Morris and Nancy Elliott at Author Strong release a new podcast every single day – it’s a great way to kick off your day and keep your writing dream alive. Writing Excuses, the Rocking Self-Publishing podcast and The Self-Publishing Podcast are all good too. Thinking about writing reminds your subconscious that it’s important to you and helps form that writing habit. Don’t be afraid to ease up every now and again, it helps you stay fresh. I write every day, but sometimes I’ll limit myself to half an hour on a Sunday and spend the rest of the day with my wife, watching a movie or grabbing a meal out. Other times I’ll do a half hour writing sprint first thing in the morning and then ignore my work in progress for the rest of the day. This is another reason for not picking too challenging a goal. If I was aiming for 1,000 words a day as my base, I just wouldn’t have the flexibility to take those easy days and I’d burn out. As it is, I can take “a day off” and still maintain my streak. The key to forming a daily writing habit, or making any sort of change, is knowing yourself well enough to be able to work with your own particular quirks instead of being derailed by them. I happen to know that I’m motivated by the metrics I gather about my writing. I like knowing how many words I’ve written over what time. More importantly, I hate the idea of breaking my streak, especially after keeping it going for so long. I use that knowledge about myself to shore up my desire to write every day so that when things get tough or we spend more time at a party than we expected, I still sit down at my desk and edit for half an hour instead of going straight to bed. Maybe you’re the sort of person that needs a reward for hitting a goal – maybe an extra glass of wine at the end of the week if you’ve written every day. Or maybe you need someone to hold you accountable – Mat Morris from the Author Strong Podcast gave money to a friend with instructions for him not to return it unless he’d hit his writing goals. Perhaps there’s a motivational quote, or a video that inspires you. Find what motivates you, what drives you, and use it. And find the road blocks that will stop you writing every day and tear them down. Writing is hard, writing every day is even harder, but don’t let the bad days overshadow the good. Don’t beat yourself up if you break your writing streak, just get back up and start again. Reread a great book, reread something you wrote that you love. Remind yourself why it is you want to write. Above all, have fun with your writing.